This is a revision and expansion sequel to "The Blacksmith Cook Book" by Francis Whitaker. Francis realized he had not addressed the beginning smith in his first book and that their was so many more things he wished he had put in the first book. He starts with discussion on lighting a coal fire and expands from there and contains a helpful index, as well. The Blacksmith Craft is a "must have" for blacksmiths of all levels of expertise! A large percentage of the proceeds of this book go to the Francis Whitaker Foundation: helping blacksmiths all over the country. 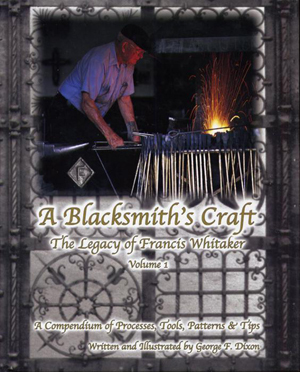 In 1987 Francis Whitaker wrote his first book, “The Blacksmith’s Cookbook.” It quickly became an important reference source for blacksmith’s around the world. As the supply of this small, red book dwindled even though the demand for it continued, Francis decided that rather than reprinting the original text, he would revise and expand it into a compendium that would preserve techniques and processes for blacksmiths of all levels.